The setup experience of Amazon’s Fire devices feels like magic compared to the competition. After doing this for a while, it’s hard to get surprised by technology. Minecraft maybe? Anki drive race cars? Definitely looking a blue whale in the eye in the blu VR demo on the HTC Vive. Most consumer technology has three layers today – hardware/device, software and services. I am still delightfully surprised by the polish on Amazon’s products, specifically the integration of services and devices (disclosure, sometimes we work on Amazon products – but this post is not about something we touched). The delight happens when you unbox a new Fire device. An Email arrives simultaneously from Amazon introducing you to your new device. Start up the device and it already knows who you are. Magic! Within two clicks of turning the thing on you see all of your Amazon content and services. 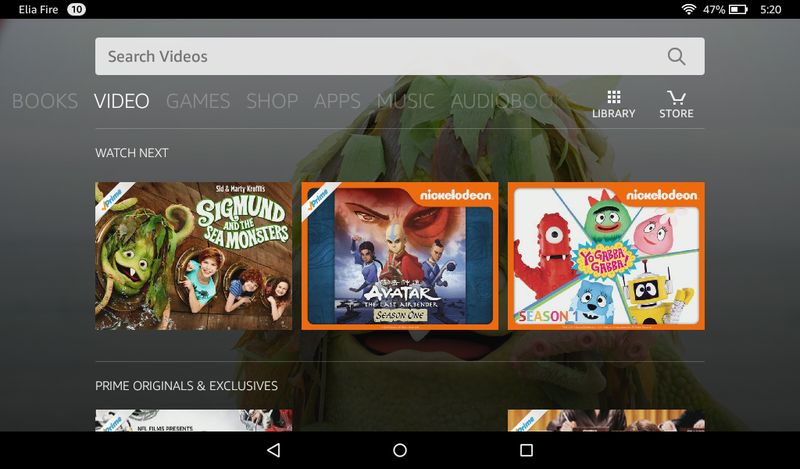 Amazon Fire OS, in action. After a few-click setup, the video library instantly reflects my viewing habits. In this case, the Sigmund and the Sea Monsters reboot. Steps three through six feel like the best technology should, like magic. Because Amazon controls the retail distribution chain as well as the device and software, they are able to ship a device that will automatically configure itself to your profile. In just about three-clicks, your entire profile is present on the device without having to look up and enter a username or password. This is many fewer steps than you’ll find with other major platforms – Samsung, Google, and Apple too. Even if those companies tried to mimic this smooth experience, without the controlled retail experience it’s unlikely they could do the something as elegant. The ease of installation and use overall makes Amazon products a no-brainer for non-technical consumers. For most people, this is how technology is supposed to work. Good experience design should feel like magic.